HeARTs in Medicine is a program dedicated to all those who work in health care or health care education. The posts represent the opinions of the authors and are meant to facilitate positive conversations and awareness of the issues around keeping our hearts in our work and addressing the epidemic of heartbreak. When the National Academy of Medicine (NAM) put out a call this winter for artwork that captures expressions of clinician well-being, Cheryl O’Malley, MD, and Robert Koch, MD, a College of Medicine – Phoenix internal medicine resident, created HeARTs in Medicine as a way to help members of the college’s Graduate Medical Education programs to express how they keep their hearts in their work. They invited UA College of Medicine – Phoenix faculty, residents, fellows and staff to write on a small paper heart a sentiment that describes what keeps their hearts in medicine. 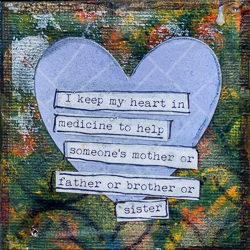 The hearts were added to small painted canvases, which were then combined and finished into one large, framed art piece by Dr. O’Malley. Nearly all of the expressions spoke of clinicians’ connections with patients and how they are able to help them through difficult times. Out of 350 entries, “HeARTS in Medicine” was among 30 chosen to be part of a pop-up exhibit during a meeting of NAM’s Action Collaborative on Clinician Well-Being and Resilience in Washington D.C on May 2, 2018. The piece also will be part of a traveling exhibit of artwork from Expressions of Clinician Well-Being. NAM – Action Collaborative on Clinician Well-Being and Resilience.